This week, we continue our celebration of the 50th anniversary of the opening of The State Museum of Pennsylvania in 1965. In the mid-1960’s, much of the research conducted by the State Museum was focused on the Susquehanna River basin and especially the Lower Susquehanna basin. Several power companies were planning construction projects and knowing of the significant archaeological sites in the region, they contacted the State Archaeologist. One such project was Metropolitan Edison’s construction of the Three Mile Island Nuclear Complex consisting of several large cooling towers and associated buildings, roads and parking areas. With funding from Metropolitan Edison, the State Museum’s Section of Archaeology conducted a survey of the island to identify and examine archaeological sites threatened by construction of the proposed facility. After years of agricultural dormancy, much of the island was overgrown with dense vegetation making surface conditions difficult for the archaeologists to study. The island had also suffered from years of erosion resulting in a mixing of archaeological sediments. Coal silt and sterile soil covered much of the island making discovery of artifacts nearly impossible. However, after a difficult survey, the upper part of the island was determined to have the best potential for the preservation of undisturbed information on the prehistoric occupation of the island. This was identified as the Three Mile Island site (36DA50). After clearing flood debris and tangled vegetation, museum staff and a small contingent of college students mapped the intact surface of the site: thereby establishing a datum point, grid pattern and a series of excavation units. Forty-nine 5 by 5 foot squares forming three principal excavations were selected for study and explored for archaeological remains. Two sections of the cleared area designated as A-D were selected for study, both of which yielded prehistoric ceramics, stone tools and related stone debitage situated in two feet of culturally stratified alluvial sediment. 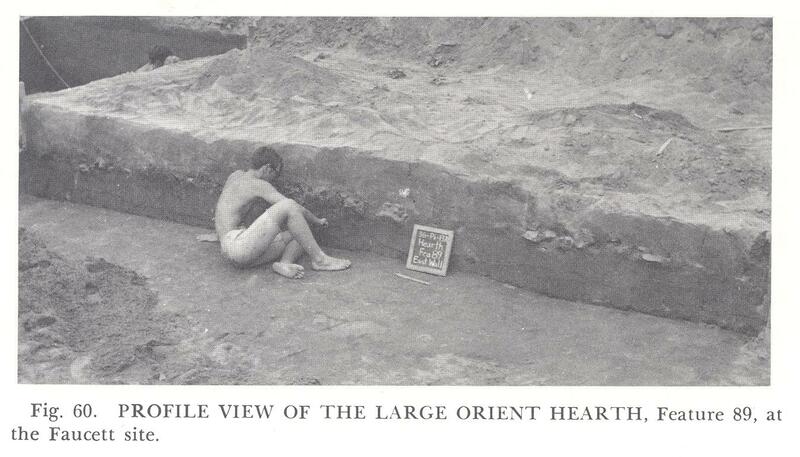 Although coarse by todays standards, the excavations were conducted in arbitrary 6 inch levels. 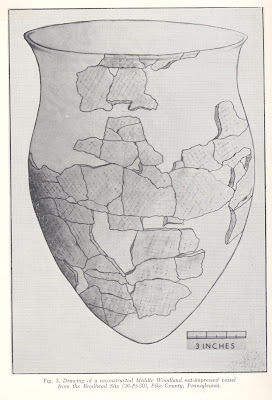 The Early/Middle/early Late Woodland Period ceramics recovered at 36DA50 include Ware Plain; Popes Creek Net Impressed; Accokeek Cordmarked and Clemson Island Cordmarked (all established types) Light Plain; Light Plain Interior-Exterior Cordmarked and Susquehanna Cordmarked (all new provisional types). 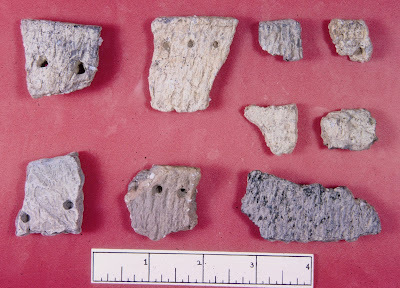 Regrettably, most of the ceramics were highly fragmented and dominated by body herds making assignment difficult as to vessel form and accurately identifying the minimum number of vessels in the sample. The stone tool assemblages, specifically projectile points, associated with the ceramic levels at 36DA50 broadly mirrored typologies of the Middle Atlantic region. 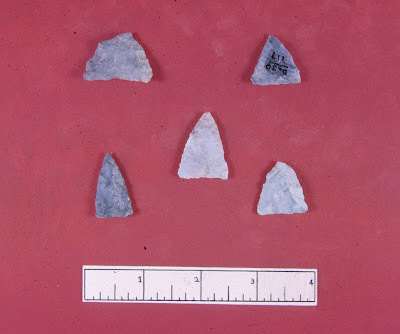 Vernon-like points seem to have a broad spread from Early to Middle Woodland since they occur with early Marcey Creek wares as well as Popes Creek and other Accokeek Creek site ceramics. Calvert-like points are known to occur in Late Archaic contexts, however, they have also been found in Early Woodland Marcey Creek contexts at such sites as the Marcey Creek and Seldon Island sites located in the Potomac River valley. 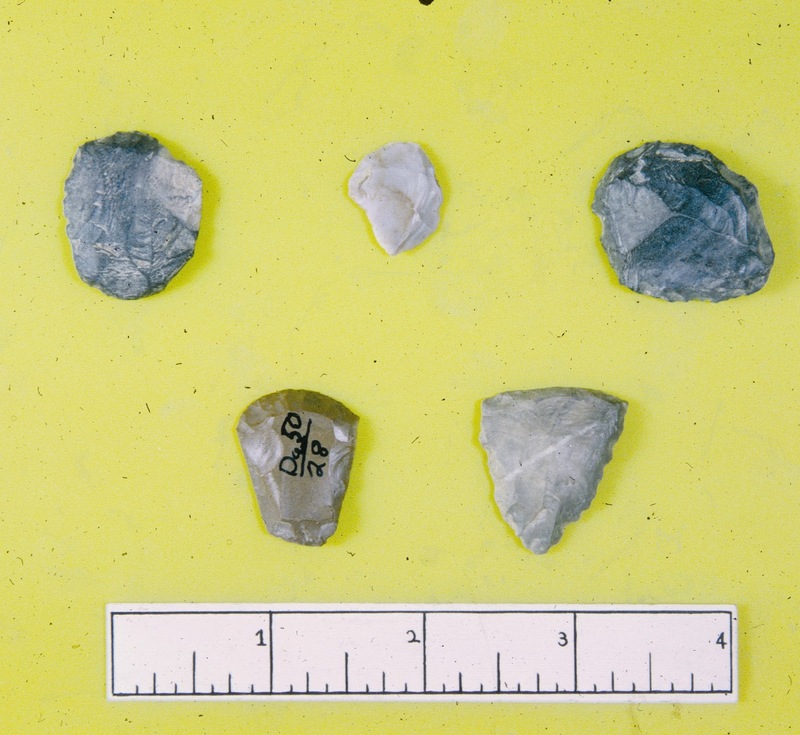 Although the lithic material was typically quartz, argillite and metarhyolite, excavations produced a jasper tool cache consisting of 248 worked flakes removed from six cores. They show considerable trimming or nibbling along flake edges and other flakes exhibit “utilization scarring” on one or more of their edges. Many also are well-worn and dulled from use from cutting things apart. Based on the pattern of edge wear there flake tools were used on ………. “hard but elastic surfaces such as bone or wood” (Smith 1970). In general terms the flakes display triangular and trapezoidal cross sections. 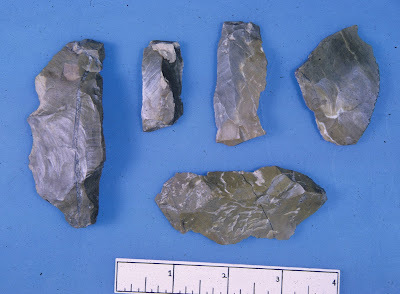 Equally interesting were the high grade stone tools classified as end and side scrapers with steep edged working areas. 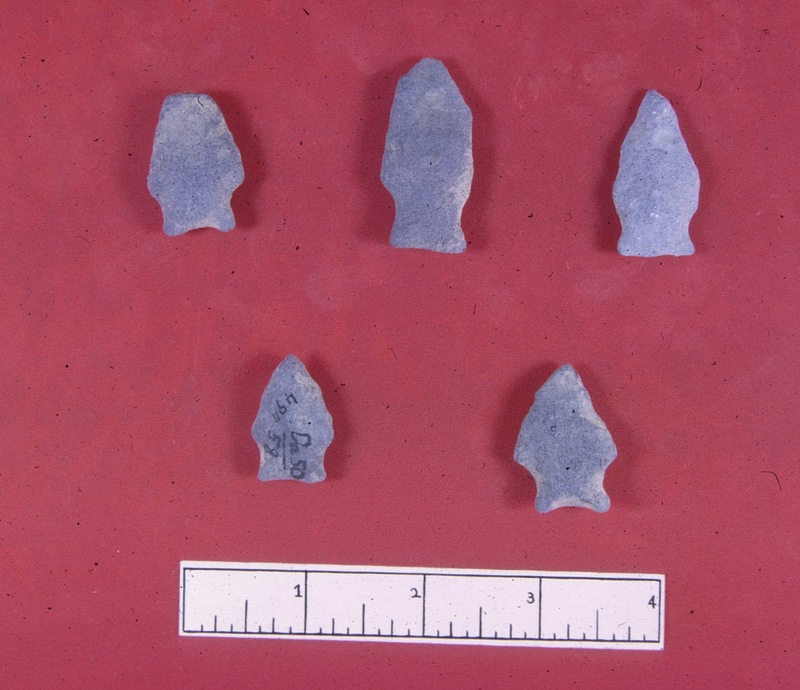 A few of these exhibited small spurs indicative of graver tools found on scrapers of the Paleoindian period. In sum, 36DA50 served as a camp site during Late Archaic through early Late Woodland times. Although no dietary remains were recovered, it is assumed Native Americans were exploiting wild plants, and animals in a riverine setting. Based on a few other sites from this period, it is also probable that they were beginning the process of plant domestication. The Three Mile Island site is significant because it represents one of the few windows into this time period of just prior to full plant domestication and the dependence farming as a way of life. We hope you have enjoyed this summary of the archaeology of Three Mile Island and please join us again for more fascinating topics from the Section of Archaeology, The State Museum of Pennsylvania. 1970 A Cache of Utilized Jasper Flake Tools. Pennsylvania Archaeologist 40(1-2):43-52. 1977 Early and Middle Woodland Campsites on Three Mile Island. Dauphin County, Pennsylvania. Pennsylvania Historical and Museum Commission, William Penn Memorial Museum. 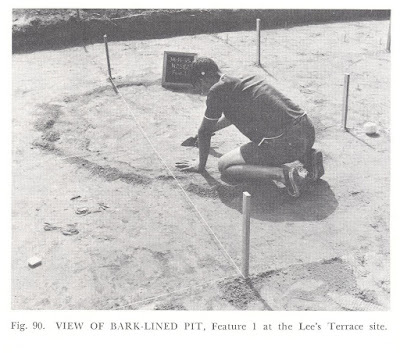 1963 The Accokeek Creek Site: A Middle Atlantic Seaboard Culture Sequence. University of Michigan, Museum of Anthropology, Anthropological Papers No. 20. Ann Arbor. 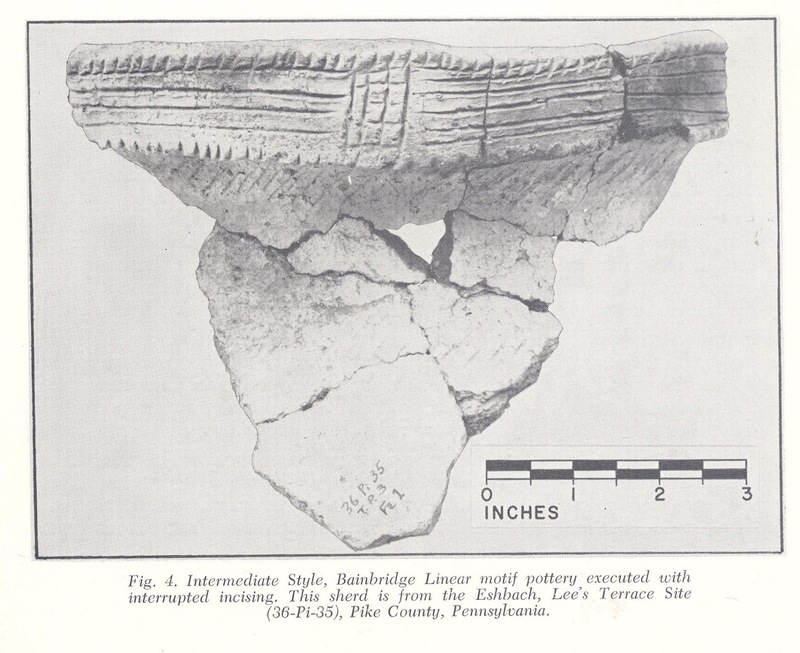 Prehistoric Ceramics in Maryland. www.jefpat.org/diagnostic/PrehistoricCeramics/index-prehistoric.html. This week, we continue our celebration of the 50th anniversary of the opening of The State Museum of Pennsylvania in 1965. The 1960’s were a vibrant time in Pennsylvania. The building of the State Museum and Archives Complex was creating a show case for Pennsylvania archaeology. The SPA was active in several field projects in the Delaware, Susquehanna and Upper Ohio drainage basins. This week we are going to focus on one of most significant projects of the decade conducted in Pennsylvania. The Tocks Island Reservoir project was an eight year investigation of the archaeological resources that may have been impacted by construction of the Tocks Island Dam and Impoundment area. 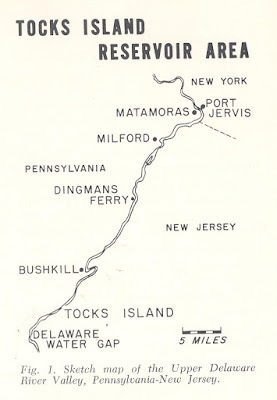 The project area extended for 37 miles along the floodplain of the river from the Delaware Water Gap in Monroe County, Pennsylvania to Port Jervis, New York. (map) Significant flooding in 1955 had resulted in loss of life and considerable damage to property. In addition, there was a desire to provide a recreation area for the major cities of the Northeast. The archaeology was funded by the National Park Service (NPS) who was responsible at that time for protecting archaeological sites threatened by federal projects. John Cotter was the administrator for the Park Service and arranged for two small grants to conduct the work; one to Franklin and Marshall College supervised by W. Fred Kinsey to survey the Pennsylvania side of the river and one to The State Museum of New Jersey, supervised by Herbert Kraft to survey the New Jersey side. At the time W. Fred Kinsey, former State Archaeologist and Director of the State Museum, had moved to the North Museum at Franklin and Marshall College in Lancaster. The project began in 1964 with survey work by Kinsey, Barry C. Kent and John Hall. Kent moved into the position of State Archaeologist at the State Museum of Pennsylvania in 1966. Fieldwork was conducted over an eight week period that summer. They were assisted by an enthusiastic group of amateur informants and members of the Society for Pennsylvania Archaeology, Forks of the Delaware Chapter. In addition, David Werner and crew from the Lenape Chapter of the Society for Pennsylvania Archaeology had been excavating the Zimmerman site since 1962 and would continue until 1967. Forty-nine sites were mapped and twenty were field tested employing surface collecting and trenching. By the end of the survey, it was realized that the floodplains contained a high density of stratified prehistoric components, varying from a few feet to over ten feet in depth. Kinsey and Kent noted in their 1965 field report that they had documented occupations dating between the Paleoindian and historic periods with Late Archaic through Late Woodland components being the most common. In 1965, Kinsey received additional funding for field testing from the NPS but also received a National Science Foundation grant for teaching high school students scientific methods. Kinsey created three crews, each consisting of four high school students, one college student and one professional archaeologist. Six sites were intensively tested over an eight week period. It became clear that these sites were artifact rich and included undisturbed living floors consisting of numerous pit features and post molds. 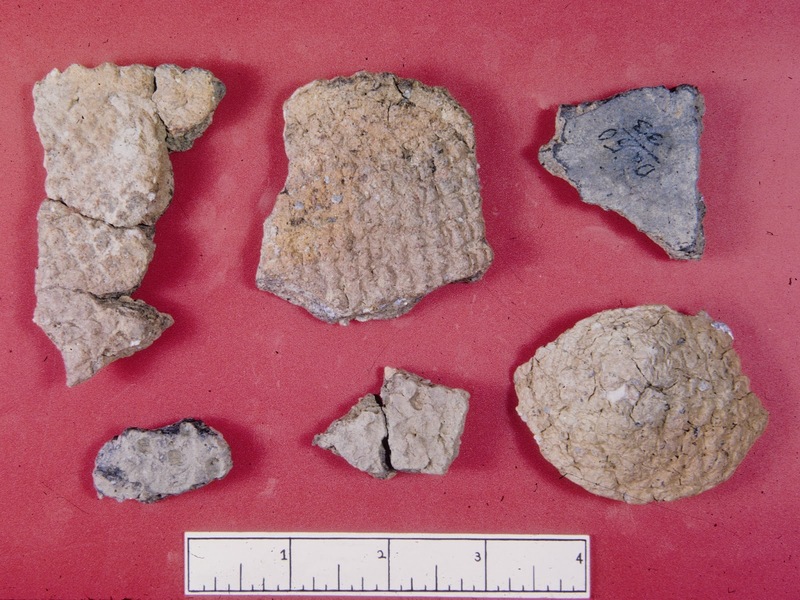 A variety of interesting artifacts were recovered including several large sections of Woodland ceramic vessels. Only one partial house pattern was recorded. Considering the common occurrence of houses in the Susquehanna and Upper Ohio valleys, it was curious that few had been documented in the Delaware. In 1966, Kinsey decided to focus on one site, Peters Albrecht, in order to expose a large amount of surface area in a search for house patterns. He continued to encounter large numbers of pit features and post molds but the post molds seemed to be randomly distributed and did not form obviously patterns. Several large fire-cracked-rock features were discovered however, one measuring 28 feet in diameter. These dated to the Transitional period and Kinsey speculated they were used for drying shad caught in the Delaware River. This speculation as to the function of these features continues to this day. Charles McNett joined the project that year and brought a field crew from Baylor University near Waco, Texas. He worked on the Brodhead-Heller site that contained well stratified Late Archaic through Transitional period occupations that also produced large fire cracked rock features. In addition, Perkiomen Broadspears were common but Lehigh and Susquehanna Broadspears were also present. Netsinkers were recovered at this site and other Transitional occupations indicating that nets were used for catching fish. McNett continued working the site in 1967 and excavated a total of 2100 square feet to a depth of between 24 and 84 inches. 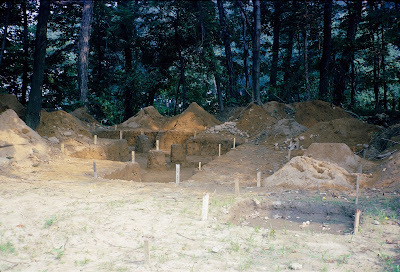 Kinsey began the excavation of the Faucett Site in 1967. This site contained significant Early, Middle and Late Woodland components and was culturally stratified to a depth of over 80 inches. Again, the Late Woodland period did not produce any houses. 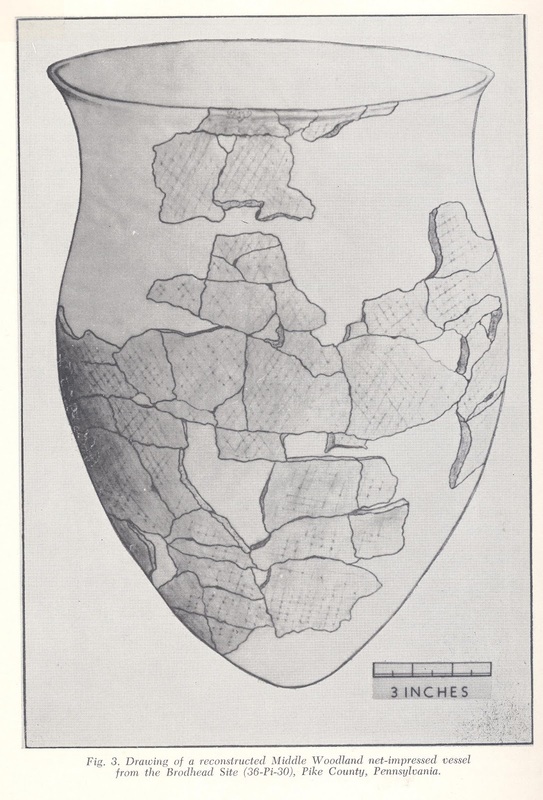 However, several pits contained distinctive pottery types and his student , Roger Moeller was able to demonstrate the contemporaneity of some of these types by cross-mending sherds between pits. The Middle Woodland period was very poorly known throughout Pennsylvania (and still is) but Kinsey and his students were able to identify a group of artifacts from this period that he used to defined as the Bushkill Complex. Excavations at the Faucett (36Pi13A) and the Brodhead (36Pi30) sites revealed a variety of artifacts, pottery and projectile point types from this period. The pottery was impressed on the outer surface with nets or fabric, and a large section of a net marked pot was found at the Brodhead site. At Faucett, a circular pattern of post molds indicated the presence of a Middle Woodland house. Interestingly, several groups of bola stones were found at the Faucett site. These are baseball-size, river cobbles with a groove pecked around the middle. It is assumed that these were used for hunting waterfowl along the river. Kinsey spent three more seasons at Faucett, eventually opening 40,000 square feet, much to a depth of the Late Archaic occupation at approximately 84 inches. The Faucett site was the most productive of the sites he investigated because it contained many Late Woodland features that produced artifacts reflecting behavior during that period but also a seemingly complete record of Late Archaic, Transitional, Early and Middle Woodland occupations. At Faucett, he was able expose large living surfaces to fully explore individual occupations. The contribution of Kinsey’s work along with his colleagues and students is in the form of establishing a basic data base on the nature of human occupations in the Upper Delaware Valley over mainly the past 6000 years. 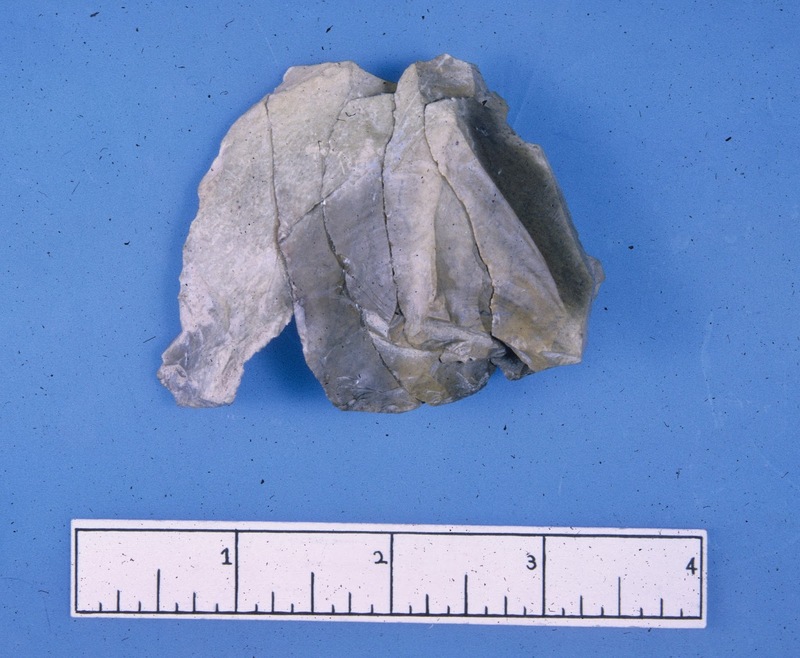 Using over twenty radio-carbon dates, Kinsey was able to create a culture history of the region and identify diagnostic projectile points and pottery types. This sequence remains a corner stone of research in the region today. Along with Herbert Kraft, David Werner and Patrician Marchiando, Kinsey published the results of investigations on both the New Jersey and Pennsylvanian sides of the river in 1972. The Upper Delaware Valley has continued to be a laboratory for the investigation of Late Archaic through Late Woodland research issues. The Tocks Island Dam was never built but the project area was turned into a national park and recreation area that attracts millions of people every year. The National Park Service has continued to conduct archaeological surveys in the region and they have added a number of upland sites that have contributed to settlement pattern studies in the floodplains. Most recently, Temple University has conducted excavations at the Manna site, originally identified by Kinsey’s 1964 survey. 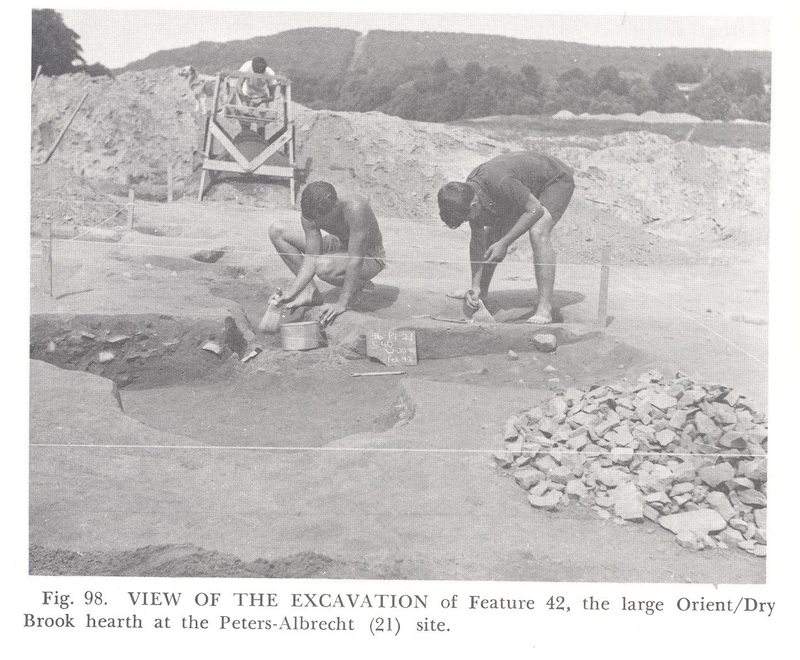 Finally, a significant contribution of Kinsey’s work was that it produced a large number of well-trained students who went on to make their own contributions to archaeology. As a personal note, I would like to add that I started as a one of Kinsey’s high school student trainees in 1965 and I am now celebrating 50 years in the field of archaeology. 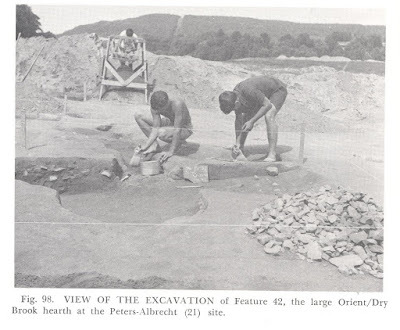 1972 Archaeology in the Upper Delaware Valley. Pennsylvania Historical and Museum Commission, Harrisburg. 1991 A Trip Down Memory Lane: Digging Along the Delaware 1964 to 1974. In The People of Minisink: Papers from the 1989 Delaware Water Gap Symposium. Edited by David G. Orr and Douglas Campana, the National Park Service, Philadelphia. 1965 The tocks Island Reservoir Survey in Pennsylvania: A Preliminary Statement. 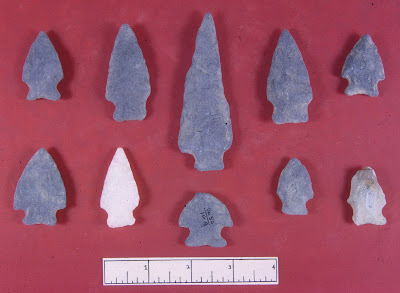 Pennsylvania Archaeologist 35 (3-4): 120-133. 1975 The Archaeology of the Tocks Island Area. Seton Hall University Museum, South Orange, New Jersey.